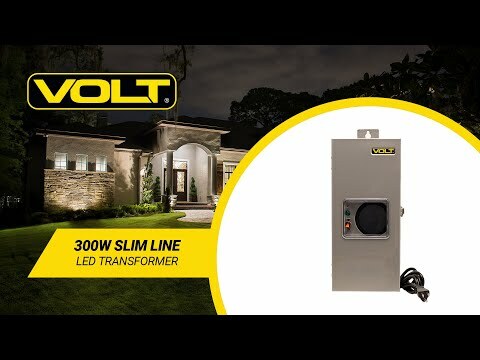 Groundbreaking 300W LED transformer for super-easy installation and control. Clamp-connects - fast, easy, and robust. 12V & 15V voltage taps. Light, efficient toroidal magnetic core. Slim, low-profile housing with stainless steel construction. This low-profile transformer breaks ground in the simplicity of installation and control. The clamp-connect terminal blocks are impressively easy and safe to use - taking seconds to connect compared to standard terminal blocks. Just insert the pre-stripped wire and close the clamp! Additionally available (sold separately) is the VOLT® newly designed timer/photocell combination. When installed, it is visible through the housing window and can be set for simple dusk-to-dawn operation, or set to turn off after a certain number of hours. Photocell sensitivity may limit transformer placement. This timer is a removable module - easily replaced. The Slim Line Transformers have an easily removable, tool-less grommet that replaces the difficult to remove metal knock-outs of traditional transformers. The grommets on the new Slim Line Transformers are removed and replaced easily if necessary. To make this transformer slimmer, lighter, and simpler-to-install, we eliminated unnecessary voltage taps. With the new Slim Line Transformer, there is no need to worry about voltage loss. Heavy-duty stainless steel construction with lockable hinged lid. Listed for both indoor and outdoor use. Toroidal core for more reliable, efficient, cooler and quieter operation. Low-profile housing for easier mounting and concealment. Clamp-connects for easy, fast, and secure connections. Accepts up to 12-gauge wire. 60" 18 AWG SJTW water resistant cord and plug set. Designed for VOLT® LED fixtures and systems. Laminated/stacked cores (also know as EI type). Laminated or stacked windings have sheets wrapped in copper wire that are then stacked or laminated together to make a core. This is the more common, less expensive method for manufacturing a core. These are less efficient, run hotter and are noisier than toroidal cores. This transformer type converts the 120-volt current to 12 volts by first increasing the frequency of the current (from 60 Hz to as high as 20,000 Hz). The increased frequency allows the use of a miniature core enabling the transformer to be very small, light, and inexpensive. The biggest downside is that their high-frequency current may not be compatible with LED circuits. These currents also suffer from extensive voltage loss compared to magnetic types. A 12-volt electronic transformer must be positioned within about 10 ft. of the fixture. Electronic transformers are also subject to overheating and premature failure.